Here’s a look at the Phoenix Real Estate Market Report for September 2018 with predictions for October 2018. 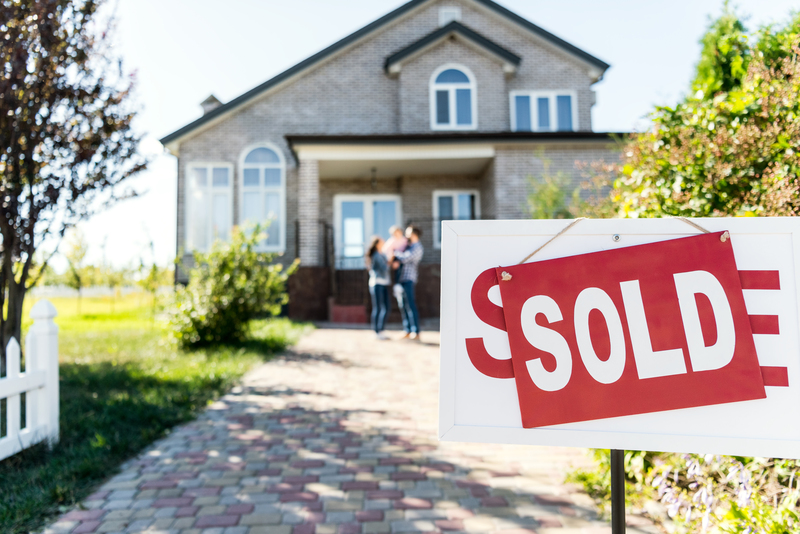 According to recent reports, buyers in the Phoenix area are still in a positive position when it comes to interest rates and purchasing a home. What’s in store for sellers? Let’s take a look a closer look at Phoenix market trends. What does this mean if you're buying a house in Phoenix? What does this mean if you're selling a house in Phoenix? October’s Real Estate Market started with a total of 8,679 homes sold in the Phoenix area. This number is down 2.2% from 8,255 last month. The median sale price of houses sold in Phoenix during the month of September was $260,000, down 0.8% from $262,000 last month. This amount shows an increase of 7.2% from September 2017. At the end of September 2018, there were 16,819 homes listed with no offer. This number is up 3.7% from 16,222 last month. This real estate market number shows a decrease of 7.4% from September 2017. What does this mean if you’re buying a house in Phoenix? The supply of active listings without a contract rose 3.7% during the month of September, while total active listings increased by 2.4%. These are much bigger increases than we saw in September 2017 (0.4% and 0.6%) so there has been a definite improvement in supply trends, even though supply remains very low by normal standards. Supply has increased the most for single-family homes over $800,000. These are up 6% in the last month. The best way to stay informed when new listings hit the real estate market in Phoenix is to sign up for email alerts. You can create property searches based on your needs and get an email when new listings that meet your criteria are active. This gives you an edge in today’s market. Here are the most recent home listings just added to the database in the median sale price range for Phoenix. All homes here are priced at $260,000 or less. What does this mean if you’re selling a house in Phoenix? This means existing listings are not going under contract as quickly. Price cuts are getting more common too. The count of under contract listings is lower than October in the last 3 years and confirms a gradual reduction in demand. If you’re considering the option of selling your property, you’ll want to know the current value. Begin with an online home valuation that gives you a good idea of what you can expect. Afterward, take it a step further and contact us for a more comprehensive report that takes the current market, upgrades, and recently sold homes in the area into account. According to the Cromford Report, we remain in a strong seller’s market and it would take many months of the current trend to get back to balance between supply and demand. September 2018 only had 19 working days while September 2017 had 20. This helps explain the weak sales counts for last month. They were down 6.1% compared to a year ago, but 5% of that is due to having one less working day. Only 1.1% is evidence of weaker demand. It is likely that higher borrowing costs are having some impact on demand but the impact is very small when placed in context. With 23 working days in October, we anticipate a strong sales count this month. Pricing was slightly weak in September, relative to August, but up significantly from September 2017. 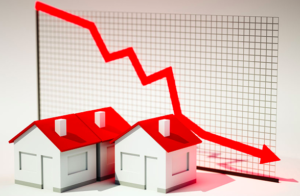 There has been no let up in the long-term price trend which is likely to see stronger averages and medians in October, now that the third quarter slump is behind us. 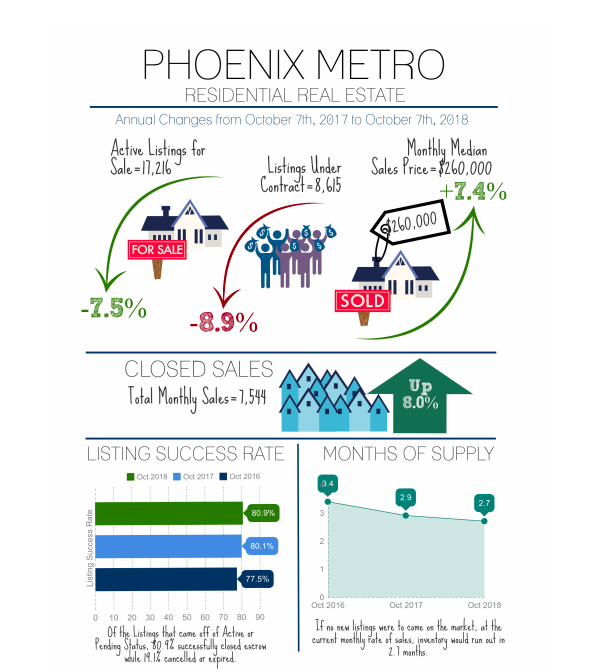 Current real estate market statistics for Phoenix, Arizona. The median sale price is currently $260,000.